The first issue of the comic ends on April 7th. At that point, we will be going on a hiatus. Here’s what that entails. 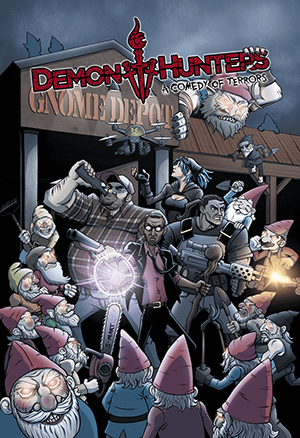 First, Ben will be fulfilling his art order for the “Demon Hunters: A Comedy of Terrors” RPG and some Patreon rewards that we’re woefully behind on. It’s a solid chunk of work, and he’s gonna go through SO many boxes of crayons! Meanwhile, I will be finishing the script for issue two. I’ve had a lot of false starts with this one (and even threw away a 3/4 finished version that I just couldn’t get to work), but I’ve finally figured out what the next story that needs to be told should be. Just need to get the rest of the words on the paper. No spoilers, but I can promise you big action, big revelations, and big half-as-long-as-the-first-story-so-it-won’t-take-another-year-to-tell. During the hiatus I’ll also be continuing with the “Storytime with KBC” and “Purple Ninja: Truth to the Head!” columns–and on a more reliable basis going forward now that the bulk of my work on the RPG is done. Once the script is finished, Ben will get to work cranking out pages. 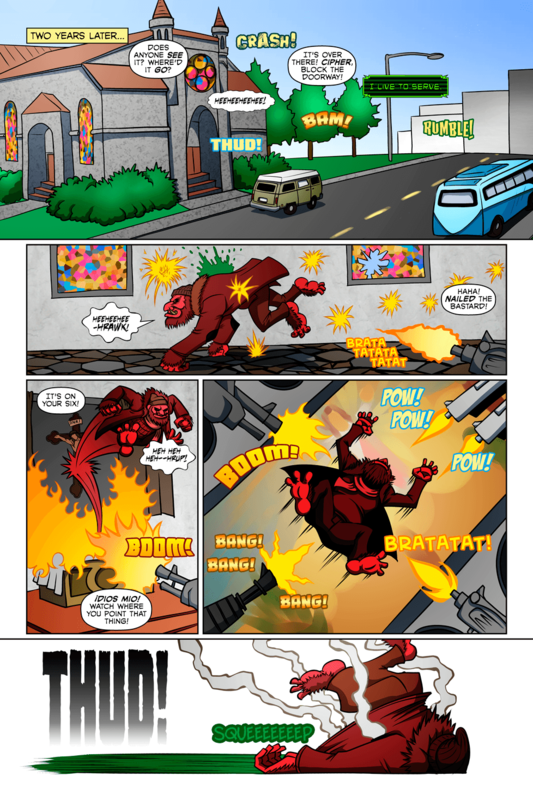 We started this comic with a ton of excitement and a bunch of good intentions. What we SHOULD have started with was a healthy backlog of finished pages. Instead, we’ve been struggling to meet deadlines and coming down to the wire every week, because there’s no room for mistakes. No room for sick days. It’s been insanely stressful, and the cause of 90% of our problems, and it’s not going to happen again. So when will the comic be back? I can’t give you an exact date. It won’t be before we’ve fulfilled all of our Patreon responsibilities and built up a sizable buffer of finished pages–no less than a full month’s worth. My goal is to be back no later than September, but we won’t force it if we’re not ready yet. That way lies madness. What I can tell you is that Issue #2 will be worth the wait! No spoilers, but I can promise you big action, big revelations, and big half-as-long-as-the-first-story-so-it-won’t-take-another-whole-year-to-tell. Come on back next week for the THRILLING FINALE of Demon Hunters: Back from the Dead, and stay tuned for more Demon Huntery adventures in the future! Thanks for a great first year, everybody! Two years later: Same crappy van. Still no oil change.